Delano Beach Club envelops sunbathers in a contemporary and distinct design. Cool whites and vibrant blues and teals extend the exclusive design of the Delano Hotel outside into the pool’s refreshing cabanas and wet deck. 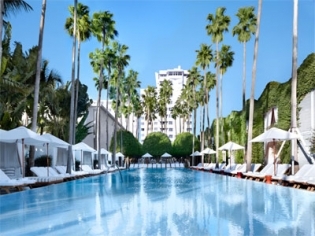 Enjoy the sounds of indie artists; savor the small bites and signature cocktails while basking poolside. There is a submerged chessboard on the wet deck and poolside massages are available to relax and rejuvenate you. Steps away from the Mandalay Bay Beach pools, the Delano Beach Club is exclusive to Delano guests or those renting cabanas. Enjoy a poolside chaise or hammock at this whimsical retreat.